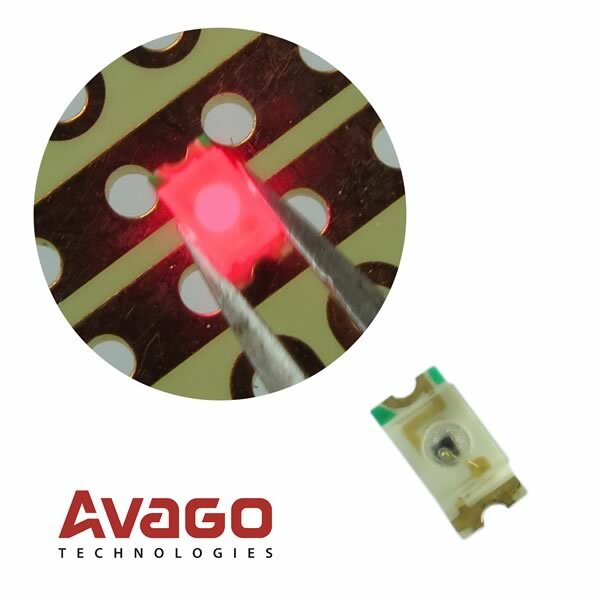 The Avago HSMH-L640 is a SMD Chip LED with an integrated lens. The lens concentrates the emitted light into a narrow viewing angle, which has the effect of doubling the on-axis intensity. These LEDs are optimum for light piping, backlighting buttons and switches, and applications, where as much flux as possible is required on axis. Lens is not tinted, non-diffused. AlGaAs Red with a wavelength of 639nm. Luminous intensity is 32 mcd and viewing angle is 70°. Forward current is 20mA and Forward voltage is 1.8V. Power rating is 65mW. Case size is 1206 (3.0 x 1.5mm). On tape and reel. Sold in a package of 25.